Part two of the summer recipes contains watermelon; one of my summer favorites. 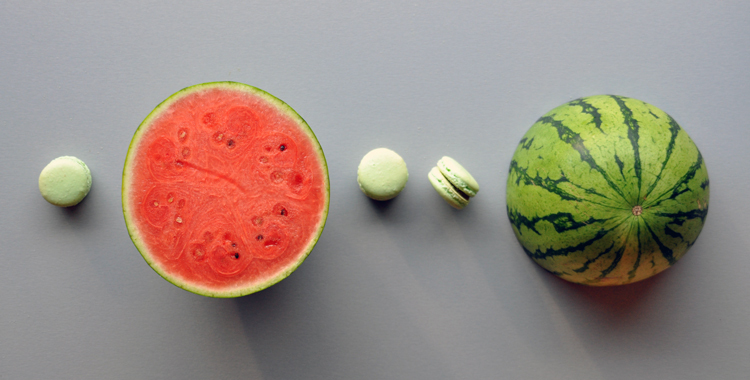 In our house we eat large amounts of watermelon throughout summer, and I just had to test how this fruit would work as an ingredient in a macaron. I though it would be difficult to capture the watermelon taste, but it came out well. Sweet and tasty! Chop the watermelon into pieces and use a blender or a stick blender to puree the fruit. Add watermelon, sugar and lemon juice to a saucepan and bring to a boil. Boil until sugar is fully dissolved, approx. 5 min. Put gelatin powder in a bowl with 4 tablespoons lukewarm water. Mix, and let the gelatin swell slightly. Remove the pan from the heat and add the gelatin mixture. (You can use pectin instead of gelatin. Read on the package how much to use.) Stir well and leave to cool. If you would like the jam to have a purer pink colour, add a tiny amount of pink food coloring before cooling.